who mountain bikes, I often get the question, how did you get her to ride with you? The short answer is patience and practice. She didn’t always go willingly. Sometimes I had to persuade her with ice cream. But when we finished the ride, she was always happy about her accomplishment. As a young mom, I took my daughter everywhere with me, including cross country races. Luckily for me, Shimano sponsored a kid race at most events that I participated in. Racing from a very young age, gave Ariana the motivation to be on her bike and ride with the others. If it was just her and I riding, it typically did not go well. About a mile in, she would find any excuse to be done. However, if we were with a group of other mountain bikers, suddenly her attitude improved, and she rode well, with very few complaints. Since I rode with all adults, they were super impressed with her, and they let her know that. Compliments coming from a non-parent were invaluable! When teaching your own kids, there are many variables, such as motivation, coordination, willingness, and most importantly having a good attitude. You cannot pressure a child or use negative reinforcement, as these tactics will typically backfire. To get around these, positive reinforcement is essential— such as telling them what they do correctly. As with any sport, every day is different and every ride is different. What worked one day, may not work the next day. Taking breaks are also important to share information such as teaching them about proper hydration and fueling up. I recall filling up Ariana’s mini Camelbak before a ride and then checking it mid-ride to discover she did not drink anything! I would then have to remind her that we live in a high desert climate and how dehydration can impair your ability to think and focus, which is crucial to mountain biking. Another tip that helped me was to take turns riding in front of and behind my daughter. 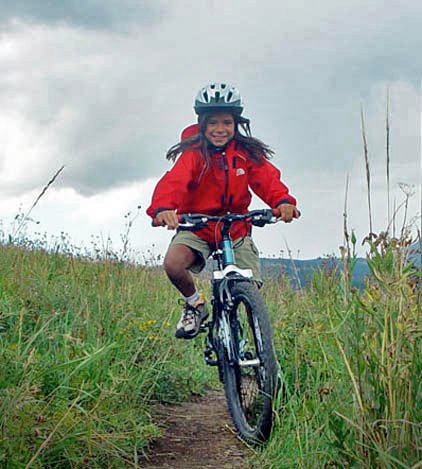 By riding in front, at a slower pace, teaches kids finesse and good line choice. In contrast, by riding behind them gives you the ability of not dropping them and watching them shred the trails! Finally (and most importantly), make it fun! This can include having them pick out their own jerseys, to choosing their own energy bars, or helping you make some from scratch. I would also get them involved in trail work days to teach them about giving back to the trails. When we lived in New Mexico, Ariana participated in trail work as part of an elementary school assignment. Besides, getting dirty is fun! If you don’t have kids, but want to inspire and mentor other kids, then I would recommend volunteering for the Colorado High School Mountain Bike League: http://coloradomtb.org.